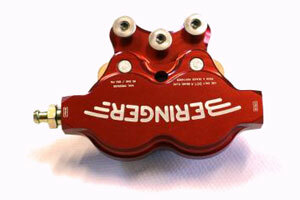 High strength aluminum alloy machined from solid on CNC, anodized for optimal corrosion resistance. TUBELESS wheel with O-rings and rigid valve. SEALED BALL BEARINGS for optimal durability: greased for life, no maintenance. Select the size of tire that you need. Then select the wheel size required for this tire (use our application chart page 18). Check the static load rating: this is the weight on each wheel (at maximum static aircraft weight) that the wheel is capable of supporting. Check the kinetic energy rating: the first function of a brake system is to transform aircraft kinetic en-ergy into heat. This heat is absorbed and dissipated mostly by the disc (a thicker disc will absorb more heat energy). We recommend first mounting of tires on wheels in our plant. This service, free of charge, includes a pressure test, ensuring maximum security of the assembly. 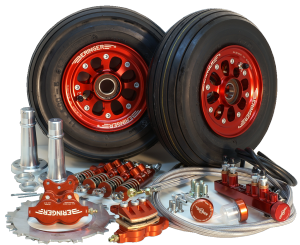 FINISH: Red anodizing is standard color for wheels, brakes and master cylinders. Other colors are available on special order with an extra delay at an additional cost per batch of parts: silver, black, yellow, titanium grey. Colors may vary..